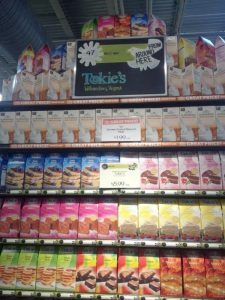 Tokie’s is recognized as an outstanding organic, preservative free, gluten and allergen free brand. It’s non-GMO, but most importantly, it tastes rich, delicious and real. The recipe for the insanely tasty, gluten-free Tokie’s brownie probably goes back further than the nickname that graces each box and bag of the bestselling mix. “Our family traces the name back to 1926 on the campus of Virginia Tech where we were dubbed the Hokie Toke family,” says Deborah “Tokie” Tokarz. 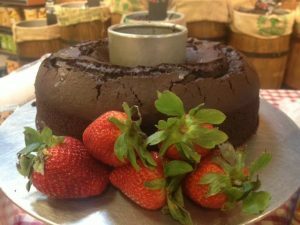 Starting a family baked goods company was never Tokie’s intention; it was a way to make money on the side as a single mother of two daughters after her divorce. Tokie worked-and still works-in the film industry as a freelance independent script packager and production manager. 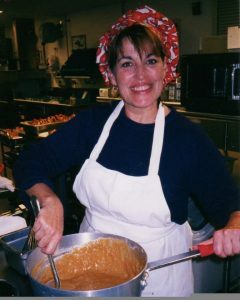 That morphed into a six-year stint cooking for Christopher Plummer, John Travolta, Jack Lemon and many others. On studio sets, actors lined up to buy her brownies for $3.00 each. It was a nice chunk of side money. “I loved working with the crew in a different way, cooking. But then, I was hit by a truck during a rainstorm and that changed everything.” Tokie suffered severe injuries and came home to Richmond to recover and reassess. “Baking has always been a part of my family’s DNA, so I baked.” A small settlement from the accident allowed her to start a unique baked goods business that grew so quickly that Tokie struggled to keep up. Her recipe was more popular than ever, but now it had a twist. “My granddaughter was born with celiac disease so now all of my recipes are gluten free.” The demand was so great that she converted the now gluten free family recipes into powdered mixes that caught the attention of Whole Foods, which wanted as much of her product than she could produce, and more. “The problem is supply and distribution,” she explains. “Tokie’s is a family owned business, still small to insure quality but it must grow, to survive,” she says. Tokie regularly gets orders from as far away as China and as close as Canada and several states. Whole Foods offered the opportunity to supply 52 stores in the Mid Atlantic Region…if she can deliver the supply. “I was on the verge of quitting,” she said. Tokie’s had become a victim of its own success. “I had been looking for financing when someone introduced me to the THRIVE program,” she says. Tokie’s had been in stores for seven years but needed help. “THRIVE was a godsend; my mentor Rebecca Thomas has a restaurant background. It’s a very different business, but she immediately understood where the pain points were. She believed the company could go national,” Tokie says. When Tokie and Thomas meet, the mentoring is intense. Rebecca coaches her to speak to executives-in terms they understand and are interested in-about the Tokie’s product line. She has regular homework, projections and sales plans. The two are going all out to expand the brand’s trajectory. When they do attract the perfect partner, all reasonable options will be on the table. “I can’t say I wouldn’t sell the business,” Tokie says. “But it would be hard because every product is based on a family recipe, every product is named for a family member or a beloved pet.” She says she’s spent thousands of dollars with other consultants, but THRIVE, with its free mentoring support, has gotten her the furthest. “Before THRIVE, I had food service PTSD. It’s that psychological pain you feel when customers want what you have but you can’t expand to give it to them,” she says. Contact tokie@tokiesmixes.com or visit Tokie’s Facebook Page for more information.